- CAD spikes Friday after show-stopping January jobs report. - But local analysts say sell CAD as global factors will dominate. - And BoC interest rate support for CAD will continue to wane. The Canadian Dollar strengthened Friday after official data caught the market off-guard with a strong increase in job creation during January, although analysts are sceptical of whether the gains will be maintained for very long. The Canadian economy created a show-stopping 67k jobs at the beginning of the New Year, up from the 9.3k seen in December and substantially ahead of the market consensus for an increase of 6.5k new jobs. This took the total number of jobs created in last 12 months up to 327k, with gains split evenly between full-time and part-time roles, which makes for total employment growth of 1.8%. Total hours worked were up by 1.2%.. However, the unemployment rate also saw a surprisingly strong increase in January with the jobless number rising from 5.6% to 5.8%, when markets had looked for a reading of 5.7%. But that was after the participation rate rose to 65.6%, inflating the number of individuals who're classed as unemployed. Six out of ten provinces saw employment rise in January, led by Ontario and Quebec, but jobs were lost in oil-producing Alberta and Saskatchewan while it was unchanged in the other two provinces. "The wild ride continues for Canadian employment readings," says Royce Mendes, an economist at Toronto-headquartered CIBC Capital Markets. "There had been some risk going into the report that a big print was coming, given that the survey had lagged the job gains seen in the more reliable payrolls report." Markets care about the labour market data because falling unemployment and improving job creation, according to conventional thinking on the subject, put upward pressure on wages and can have implications for interest rates. "It's been a good day for readings on the Canadian economy. That said, first quarter growth is still setting up to be somewhat weak given what we know is happening in the oil patch. 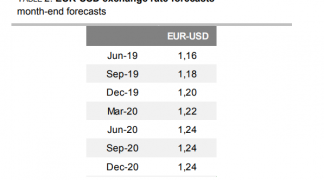 So while today's data will be bullish for the Canadian dollar and bearish for fixed income, the Bank of Canada is still likely on the sidelines for the first half of 2019," Mendes adds. The USD/CAD rate was quoted -0.58% lower at 1.3239 following the release, after extending an earlier 0.02% loss, and is now down -2.6% for 2019. Canada's Loonie swept higher against all its rivals following the data. "Dips in USDCAD are likely to be bought following a clean technical breakout of the 100-day-moving-average," says Mark McCormick, head of FX strategy at TD Securities. "A move through 1.3350/80 resistance would open up major topside extension risk." The Pound-to-Canadian-Dollar rate was quoted -0.43% lower at 1.7159 after reversing an earlier 0.1% gain, and is now down -1.2% for 2019. Sterling was once the G10's star performer this year but the ongoing Brexit saga has since checked the market's appetite for the British currency. "CAD's beta to risk and oil have risen appreciably suggesting difficulty in sustaining gains with any degree of confidence amidst a slowing global growth backdrop," McCormick adds. Friday's labour market data comes immediately after a punishing session for both oil futures prices as well as the Canadian Dollar. After a solid and near-20% gain for major oil benchmarks in January, prices were undermined on Thursday by concerns about the U.S.-China trade talks. 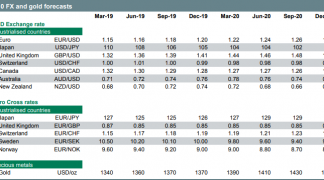 That led markets to conclude that a March escalation in the tariff spat between the world's two largest economies could be likely, which has dented growth sensitive commodity prices and currencies including the Canadian Dollar. Above: WTI crude oil futures price. Friday's jobs data matters because of what it could mean for Bank of Canada (BoC) policy. The BoC said in January it will be more cautious about raising rates than earlier guidance suggested it would. The message was clear in that it will move more slowly than before. "With global central banks now pivoting to the sidelines for an extended period, the hurdle to bring the BoC back in play anytime soon is high. This also implies that CAD will become more responsive to global factors," says Mazen Issa, another strategist at TD Securities. Issa and the TD team say they expect only one rate rise from the BoC in 2019 and one more in 2020 to complete the bank's interest rate hiking cycle, which would leave the cash rate sat at 2.25%. That's substantially lower than previously thought and in line with what markets are currently pricing. It would take a meaningful pick-up in Canadian growth and a more stable outlook for the global economy in order for markets to support the Loonie by betting on a larger number of hikes coming from the BoC. Few investors today see the BoC lifting its interest rate again any time soon but not all economists are throwing in the towell just yet. Toronto-headquartered RBC Capital Markets forecasts two hikes this year, but that projection is contingent on a number of factors. 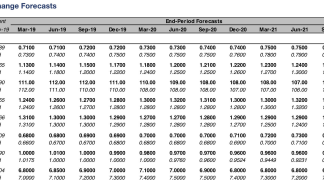 "Our forecast continues to assume further tightening, albeit at a gradual pace, with the overnight rate rising 50 basis points over the course of 2019. However, such is contingent on further indications of continued strength in the economy along with confirmation of greater wage pressures building in the system," says Paul Ferley, assistant chief economist at RBC.